Schools across Lancashire swam their way to success at this year’s SPAR Lancashire School Games Disability Swimming Gala. Children from 14 schools represented their districts as they joined together at Salt Ayre Leisure Centre in Lancaster to compete at a county level. Students from across Blackpool brought home a total of 45 medals, including 17 gold, 16 silver and 12 bronze. The haulage included first place in the key stage three boys 25m front crawl by Joel McIntosh from Great Arley School, while Jessica Reid from Great Arley School secured gold in both the key stage four girls 25m front crawl and back crawl races. Meanwhile, four East Lancashire schools which included Ridgewood Community High School, Burnley, Chorley-based Mayfield School, Pendle Community High School and Tor View School from Rossendale took home a total of 31 medals between them as they swam to success in the pool. 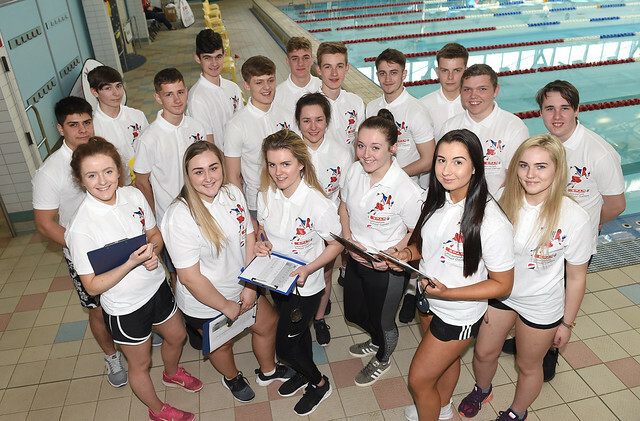 The success did not stop there, with West Lancashire Community High School pupils doining West Lancashire proud by bringing home a total of 34 medals including ten gold, 14 silver and ten bronze. Team Lancaster and Heysham also had a successful day as they shot to success at the event, racking up an impressive 16 medals including eight gold, three silver and five bronze. This success was helped by Nathan Smith and Jack Winn from The Loyne Specialist School, who brought home gold in the key stage four boys 25m back stroke and front crawl races. St Mary’s Catholic Primay School from Heysham kick-started the swimming gala by performing a street dance routine which got all participants warmed up and ready to go. Throughout the day, children also had the opportunity to participate in wheelchair basketball and handball taster sessions with Andy Whitaker, from the Lancashire Football Association and Mark Stephenson from Lancashire Sport Partnership. Young sports leaders from Lancaster and Morecambe College provided a helping hand by encouraging racers and keeping times for each race. Joining them to have some fun was the official school games mascot, the Lancashire Lion. Showing support for the SPAR Lancashire School Games Disability Swimming Gala this year was Mayor of Lancaster, Cllr Roger Mace with Mayoress Joyce Mace and Deputy Mayor of Blackburn with Darwen Borough Council, Cllr Pat McFall. Meanwhile, Peter Dodding, sales and marketing director at James Hall & Co, was joined by a host of SPAR retailers to cheer the competitors on. Peter Dodding, sales and marketing director at James Hall & Company Ltd, said: “The Disability Swimming Gala is about taking part and having fun. It is a highlight in the SPAR Lancashire School Games event calendar and gives children of all abilities the chance to take part in competitive sport. Each year we love seeing the games evolve and already this year is no exception. It is brilliant to see familiar faces working on their sporting ability each year. The Disability Swimming Gala is the first of two main events in the SPAR Lancashire School Games calendar. More than 3,500 children from schools across Lancashire’s 15 districts are currently battling it out for a place at the county finals which will be held at Blackpool’s Stanley Park on July 3. Schools will compete in 16 sports this year, including gymnastics, football, athletics, mixed cricket and touch rugby. The SPAR Lancashire School Games is the biggest school games programme of its kind and is implemented by the county’s school games organisers. This year will mark the twelfth year the county’s school games programme has been sponsored by James Hall & Company Ltd, the SPAR distributors for the north of England. Over £128m of National Lottery and Government funding has been invested into the school games programme.